Congratulations to Christina Li, Tuesday’s winner in our Countdown to the Holidays celebration. We were certainly entertained by the many different renditions of Jingle Bells that came our way. Thanks to all who participated! 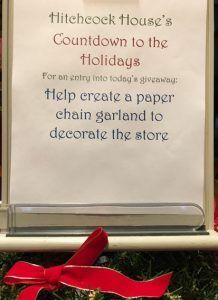 Wednesday’s holiday activity is creating paper chain garlands to decorate the store. We supply the materials, you supply the creativity. Add to our chain to be entered in the daily drawing. Fantastic prizes totaling nearly $1500 have been donated by our vendor partners this year. Don’t miss out. All in the community, young and old are welcome to participate. Hitchcock is open from 8:00-5:00 today.